Before I start, I'll have pictures tomorrow or the next day because my phone has decided it's not a photographer anymore. So...I left with a 9mm instead. I wanted to spend $400-$500 and I spent $700 OTD. The pistol exudes quality in that the slide and frame are extremely thin and are obviously machined out of really nice alloys. I'm drinking the cool aid about their wonderful CNC machining and super high quality Lothar Walther barrels. This Kahr isn't the typical skinny polymer pocket pistol, which made the company imminently popular among CCW holders. 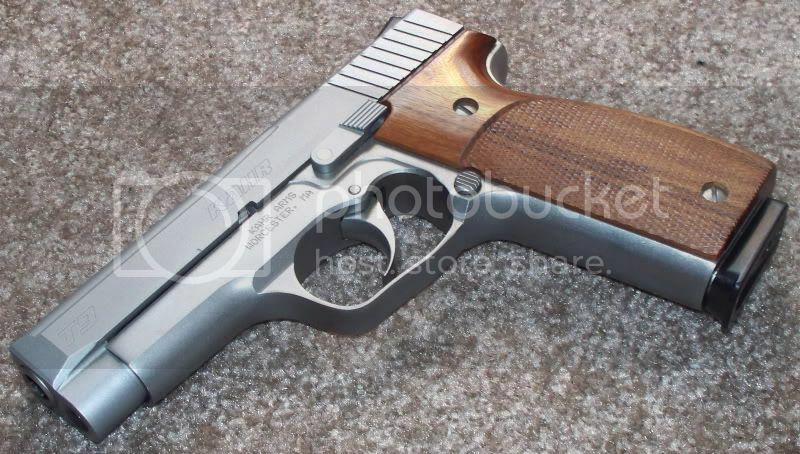 Due to the high quality wood grips, the gun feels exceptionally full in one hand or two. It's thicker than a single stack, but skinnier than any double stack. It's the most versatile gun as far as grip is concerned, which is part of the reason I bought it. The Kahr T9 is a "double action," in that it requires a full trigger pull to bring back the firing pin and release the hammer. In reality, it's the smoothest trigger you can "get away with" without having a safety. The tension is progressive, however there's no clear/crisp break in the trigger. It's like shooting the lightest trigger revolver in the world, which is perfect for me because I own a few revolvers. With practice, it'll be dead on. Kahr recommends 200 rounds before the gun is reliable. I haven't had a misfire yet, but I did have a slide that didn't lock on the last round in the first 30 shots. No big deal in my books. If you like pistols that feel nice in one hand or two and are nicely machined, this is up your alley. Nice gun. My kahr needed about 1000 rounds before it was reliable. No joke. But i love it now. Congrats. I have the slightly smaller MK9 Elite.....love it.